You are currently browsing the tag archive for the ‘Prayer’ tag. 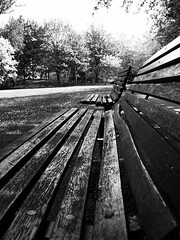 He looked around, spied a park bench and sat down to pray. As a Christian and parent of young children (one soon to be 6 year old and 3 year old twins), I feel challenged to teach my children to establish a habit of praying regularly. I know that they are young, but as with good manners and eating habits, it’s never too early to start laying the foundations for later in life. As such, here is the strategy that I’ve put in place to teach my kids how to pray.